Happy Friday! I like to do a weekly post but this week I don’t have any finished garments to show you. Lots of things in process, my favorite being this one. I posted it on Instagram and mentioned that I was loving the pattern choice but not so sure about the fabric. Well after a week of looking at the partially finished item which is pinned on my dressform - set aside while I deal with lots of other projects – I can say that I am crazy about it and can’t wait to finish. And realize why I bought the fabric in the first place. 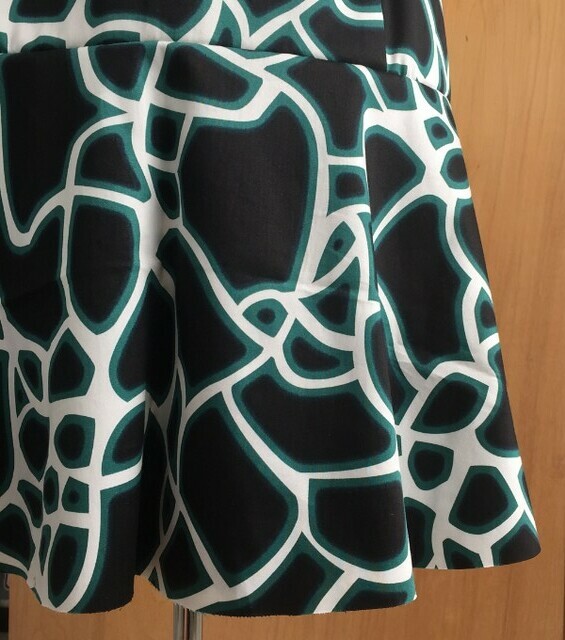 A cotton/lycra sateen I bought at Stone Mountain last year on a whim when I was thinking I needed some prints and colors in my wardrobe that were not turquoise. The pattern I am using is the Pauline Alice Alameda, and that is all I will say until it is done. You know I am not usually an indie pattern girl, but her styles are really clever and also very professionally done. Our hot weather has arrived and consequently things are getting very brown – although not as parched as they probably should be. Still a surprising number of lush lawns in my neighborhood. I heard a perspective story on NPR radio the other morning saying that instead of being nicknamed the Golden State for our sunshine and actual gold ore discoveries we should instead become accustomed to being the Golden State for the golden brown hills and general lack of greenery. So on that note I will recommend a blog post of my friend Veronique who I met through our local sewing blogger group. She is doing drawing more than sewing these days and has great post illustrating the water shortage in an entertaining way. All her posts amaze me (she helped me make my sewing lesson website) and whenever I see one of her floral illustrations I want to have her print or draw on some fabric so I can sew it. I will ask her about that next time we get together! Speaking of blog recommendations, I have some others for you today. In the spring my friend Meg (blog: megmadethis.blogspot.com) came over for a jacket sewing intensive lesson. As she saw me at a meet-up wearing this jacket she decided she had to conquer jackets (always something I like to hear, considering my jacket obsession). So she came over for an all-day session and we got just enough done – including a lot of the tricky bits – so that should could finish it in her own. 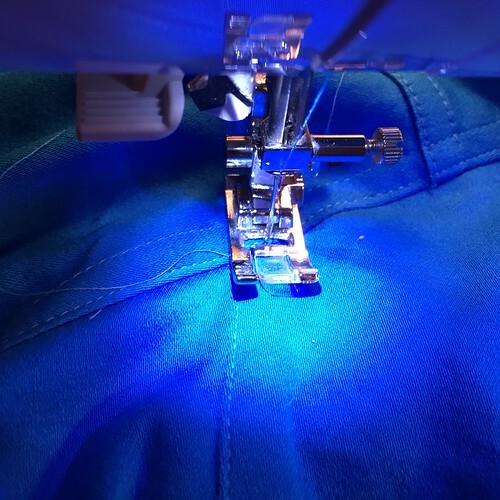 She has now written a couple of posts on the process, and since I get a lot of positive comments on my tailoring process posts I will point you in the direction of her blog. It was really interesting to hear about my teaching style from the other person’s point of view. Which may be that I have strong opinions on how to do things? Actually I didn’t need to read her post to confirm that. But you can tell she is a good student – I don’t mean a good student of mine but a very very smart person who grasps concepts and can write about them clearly. She is going to grad school in the fall so her brainy ways are a plus, and lucky for her pals she is staying in the area. An aside, she is a pants fitting wizard! 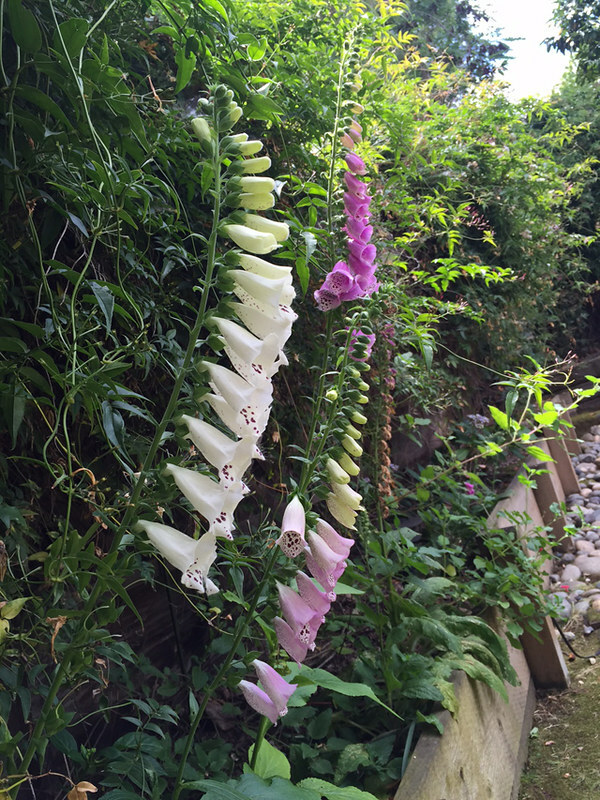 She wrote two posts – part 1 and part 2. But we have to wait for the final reveal! Do you get really happy when you discover an interesting new-to-you blog? I do. Particularly if the writing is great. So I direct your attention to Wasted Weekends – misadventures in crafting. That has to be one of the all time great choices in blog names. She is a writer by trade and a sewer by obsession (aren’t we all?) so has documented the good and the bad of her recently discovered pastime. Plus she made her wedding dress! As a novice sewer. Apparently finished with moments to spare! Read all about that and other topics. I look forward to her next adventures. And Seam Ripped, do you read Charlotte's blog? Subtitle: a sewing blog without the sewing. Which is not entirely true. Some sewing, but more often a very smart and interesting discussion about sewing, fashion, what women wear for work and play. Plus the occasional pattern review, stash update and video post. 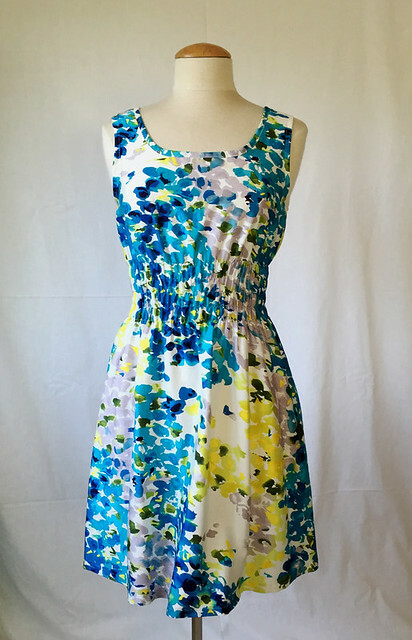 There are some brainy women out there in the sewing blog world. Well, I knew that, brainy women everywhere, but thanks to the sewing blogosphere I get to meet more of them. Happy weekend and never wasted when sewing, right? 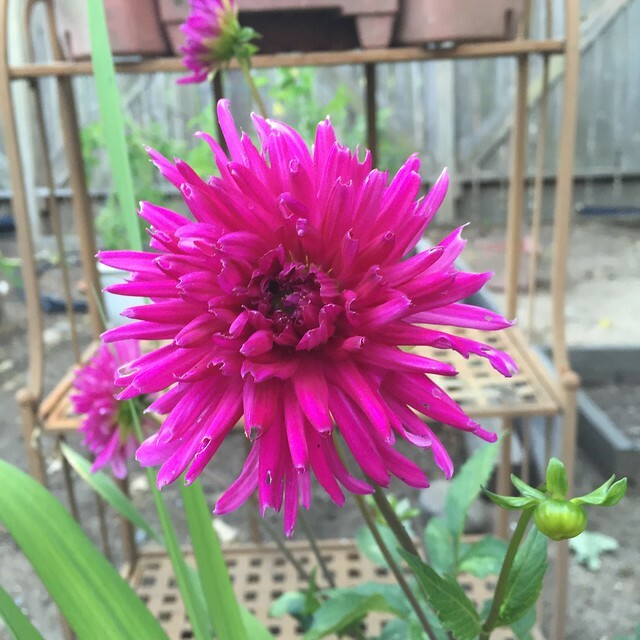 today's garden photo, the first dahlia bloom of the season, such a summer flower and I love these spiky ones. Vintage patterns are not something I use very often but recently I pulled this dress out of the closet and realized it hadn't made an appearance here. 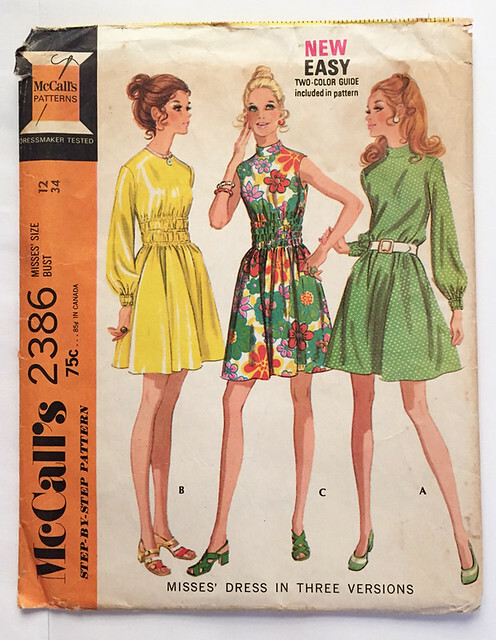 For a while I went through a phase of looking at all the incredibly cute vintage patterns available on Etsy or Ebay and then ordering a few. Not with any real intention of sewing them up but just because they were so pretty or unusual. I also went through a phase of selling on Etsy, so I bought a fair amount of yardage which I have been sewing from for a good two years now. I saw this fabric on line and ordered a lot, like 12 yards as the price was very low, and then when it came I loved it. 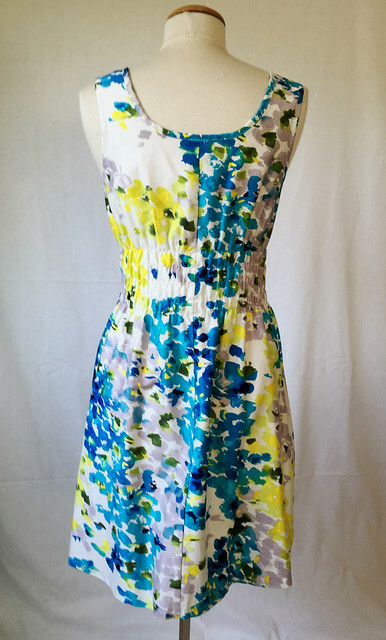 I made a sample dress, someone contacted me on Etsy. Long story short I made 5 bridesmaid's dresses using this print and had about a yard or so left. 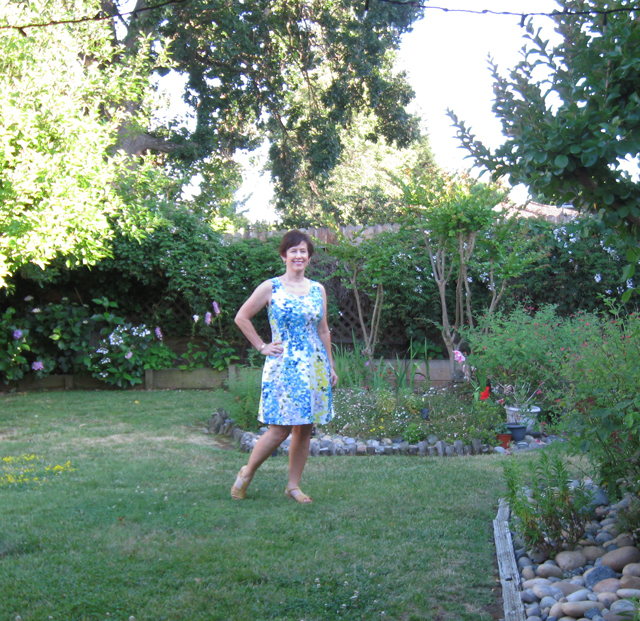 Yes - I am short and can get a sleeveless dress out of about 1 yard of 60" wide fabric. So that is the kind of long backstory of how this dress came to be sewn up. 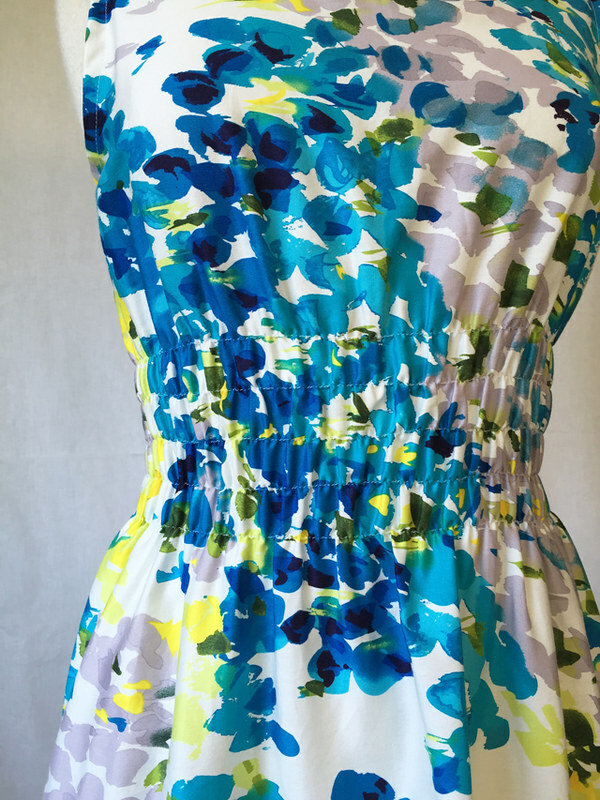 Here is a close up look at the detail on this dress, which is really simple but clever and easy to sew. The shaping is achieve by sewing with elastic thread along pre-marked lines at the waist. Here is the pattern envelope. You can see I changed the neckline area quite a bit. 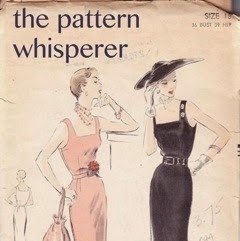 As it it so reminds me of the later season costuming on Mad Men. Can't you imagine one of the women in the office wearing any of these 3 versions? Looking at the pattern envelope brings me to something I was thinking about the other day. Why not just draft the pattern instead of buying one for that simple detail of where to put the elastic stitching? Anyway - I am happy for the commercial pattern companies, old and new, to do all that work for me. Dart placement, collar size, skirt width, seaming, etc are all such issues and if the proportions are not right it just bugs me. (my current pet peeve, some indie patterns where the darts are way too long and end up looking strange or too noticeable) OK rant over. And conversely, to stick up for indie patterns I just started another Pauline Alice pattern last night, it is looking good! Front and back views. 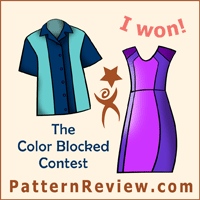 I was actually careful with the pattern placement, yellow is not my favorite shade to wear - don't think I have a single yellow item - and so I wanted the mostly blue/lavender sections on the front bodice. 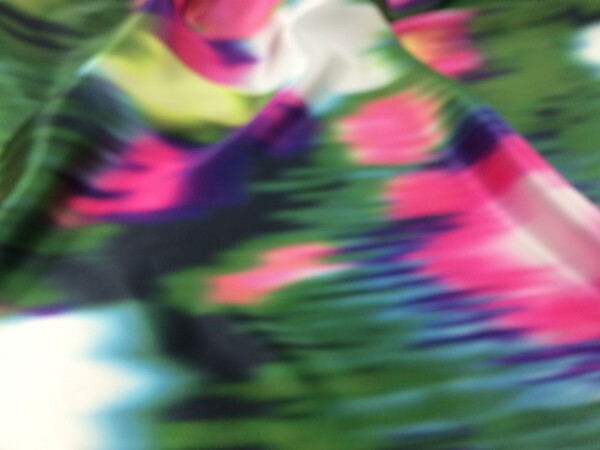 This fabric is cotton sateen, with no stretch, and very lightweight. To me it is gorgeous, both the quality of the fabric which really surprised me - ordered from Fashion Fabrics Club - and the coloration. I just think it looks like a beautiful abstract watercolor painting and the color combo is beautiful. 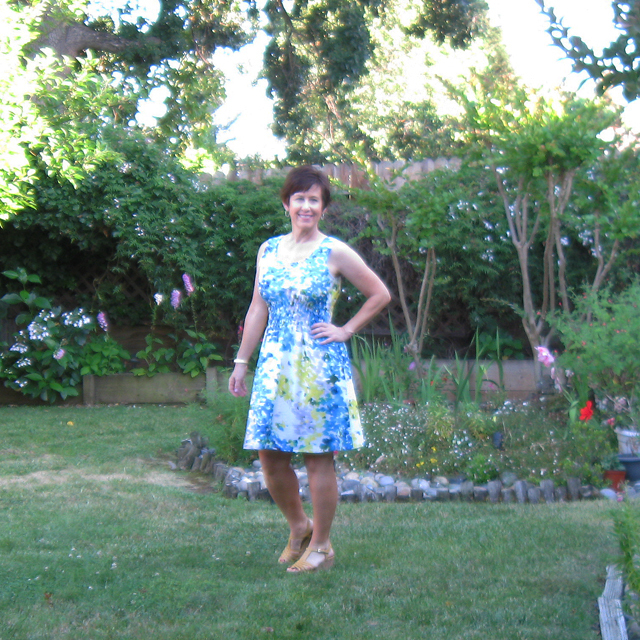 For the neckline, I think I used one of my other sheath dress patterns that has a square neckline and copied the depth of that. (proportions again) . 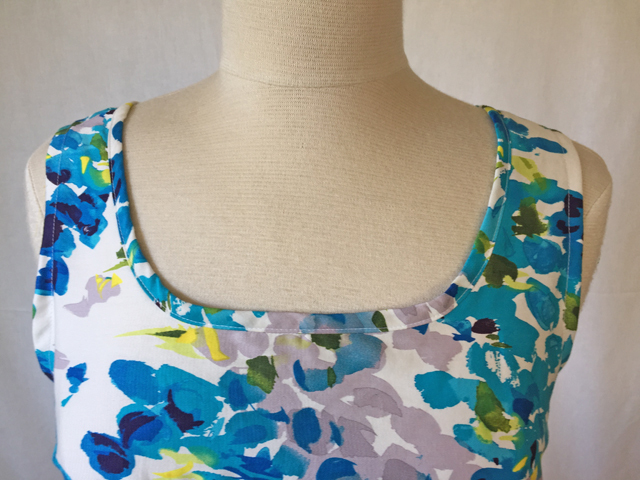 I really like a square neckline, it's my favorite shape (as opposed to V-neckline: nice, round neckline: just OK, boat or high neckline: serious dislike) So I copied the square neckline but rounded the edges a bit as that makes it easier to apply the bias binding and looks a little softer. So in my mind I call this the "roundish square neckline" and I have used it a lot over the years. For the binding I wanted a visible binding as this gives a nice finish and emphasizes the neckline - as opposed to sewing a binding and turning to the inside and topstitching. I am not a fan of using bias tape for binding, it seems just a smudge to bulky or stiff for anything other than mid-weight cotton. But I did use it for the armholes as there was nothing left of the dress fabric. Now one more pic which made me laugh when I saw it on the laptop - what is up with that pose? Mail order catalog model? Bendable Barbie doll stance? Didn't you put your Barbie in this exact pose? I always found Barbie kind of annoying, and my sister and I always lost the stupid tiny high heel shoes immediately so ours ran around in ball gowns and bare feet. Our dolls did a lot of swimming since that is what we did all summer in the backyard consequently their Barbie hair was completely fried. Come to think of it, our hair probably was too! Chlorine from the pool and lemon juice to try and create blond highlights. Oh well - it was natural and organic, ha ha. I wanted to take some blog photos on Wednesday as it rained most of the day here, to document a dash through the raindrops but it was actually pouring. Crazy! Oh well the plants liked it. Now today it is over 100˚F here. More crazy! Summer in California. As we all say "at least there's no humidity!" 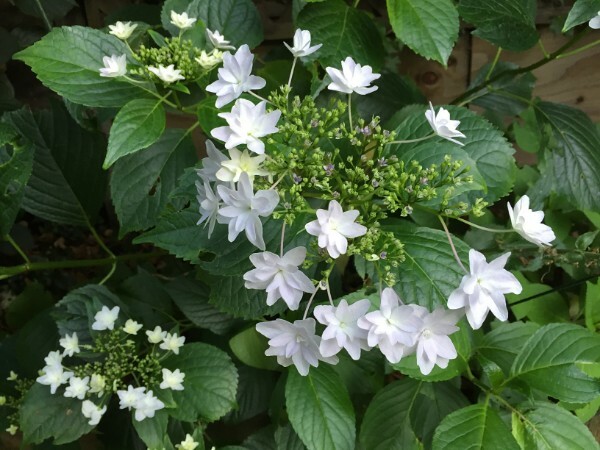 and in the background in this photo above, on the left, is the shooting star hydrangea. It is getting huge and I am so happy. I think my mom bought it for me about 3 years ago, it was in an 8 inch pot and not very big. It must like that spot because this year there are a lot of blooms. Pretty huh? and so nice when the small white flowers dance in the breeze. Today we have a tale of two jackets. One I made at the end of last summer and put away, due to what seemed like a serious error, but it might be redeemed on closer inspection. (Or time in the magic closet? a well-used and very apt phrase). The other is just recently completed, using a pattern repeat and while I think it will have a place in the rotation, it might not be quite the home run that the first version of this pattern turned out to be. So you can be the judge, shall either of these be benched or make it to the starting lineup? Enough baseball metaphors yet? Now I am determined to think of some others. At the top of the order is my pattern repeat, the Jacket Express. 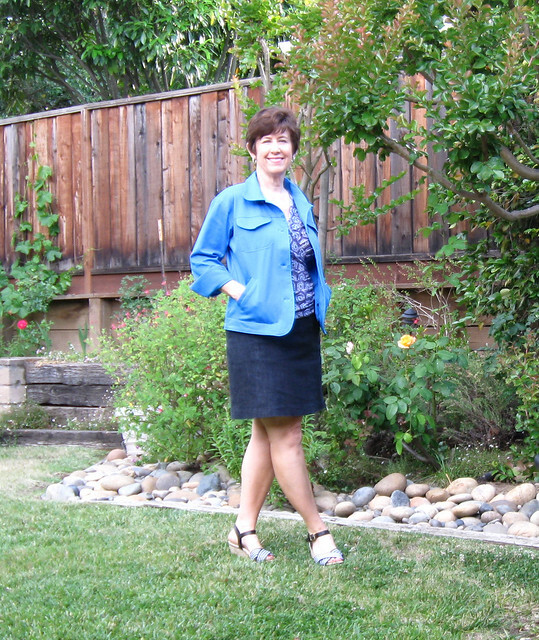 This is a jacket pattern from Islander patterns that is included in the Craftsy Class: Sew Better, Sew Faster: Garment Industry Secrets. You may recall I made this previously, here is a link to that post which has a lot of info on making this jacket. 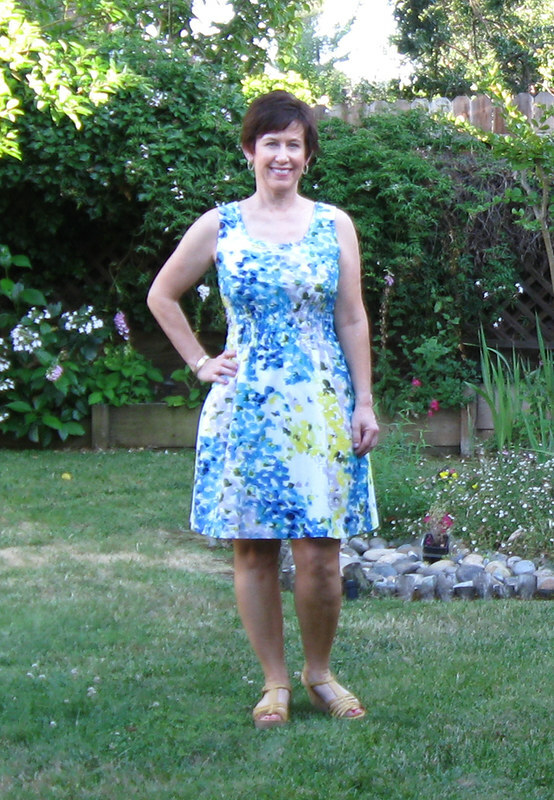 This is a pattern that is included in the Craftsy Class: Sew Better, Sew Faster: Garment Industry Secrets. It is from Islander Patterns. I made it from a red denim that I found somewhere and it turned out to be something I wear ALL the time, as it helps to avoid the dreaded denim jumpsuit look (blue denim jeans + denim jacket = bad 80's music video or something equally hideous). 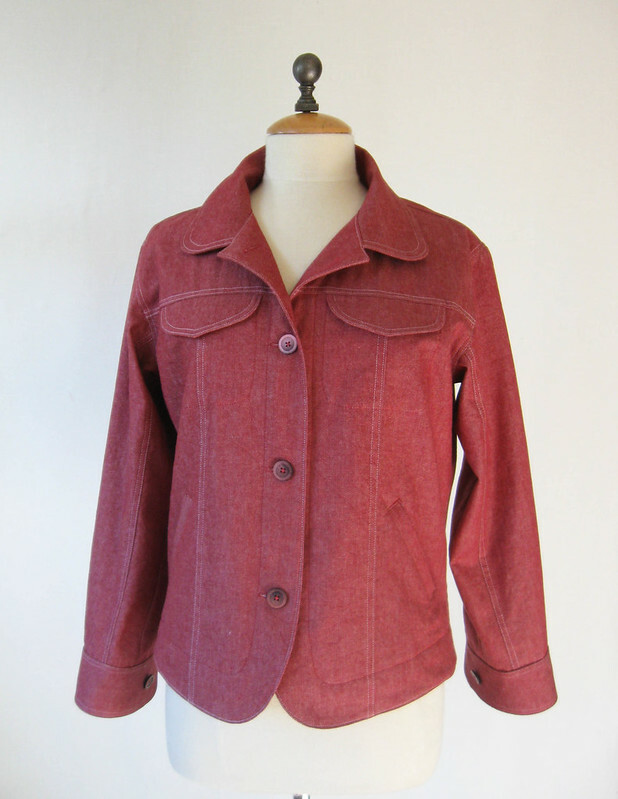 The red in this jacket is just washed out enough to make it a very versatile neutral. Also hideous, the versions on the pattern packaging. Anyway - if you are interested in the sewing details - and there are quite a few - in my previous post, here is the link. Also I wrote a second post reviewing the Craftsy class which has other sewing details and some more pictures so here is that link. Sometimes I just decide to swing away and make something even though I have a zillion other things I could be doing. 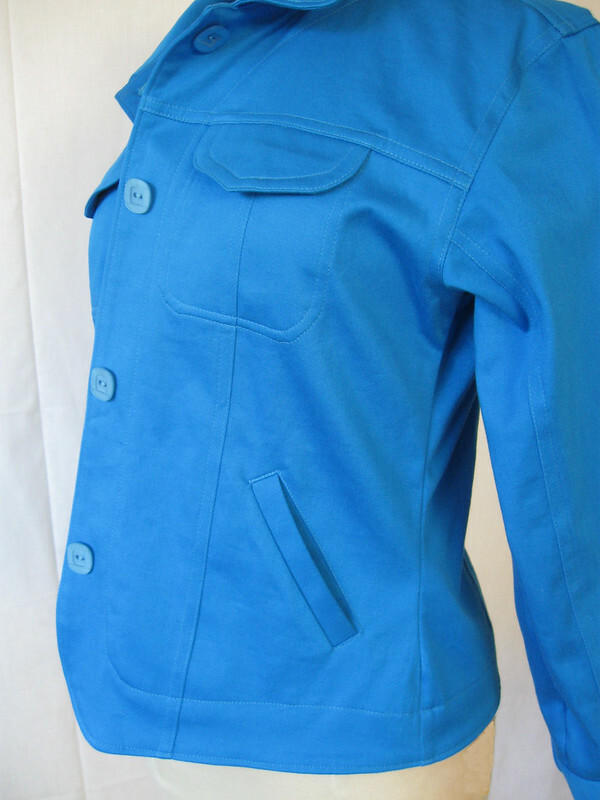 But this jacket was on my mind, as I am going to make a similar jacket for my mom, from that pineapple denim I bought from Girl Charlee (visible in this post). So I made a test version in her size of this Islander jacket. And she didn't like the way it fit and felt. So I tried to adjust it but wasn't getting anywhere. Then she pulled a cute denim jacket out of her closet and said "I like everything about this one, can't you just make it exactly like this?" Yeeessss I can....by spending a good chunk of time (it takes me about 2 hours) making a copy pattern, then sewing up a test version just to check. So that is done and soon I will start on her jacket. But meanwhile, back to mine. I wanted to try it out in stretch woven. This pattern and the instructor are VERY specific, in fact adamant - insistent - demanding that it be made in a regular woven. So phooey with that. Stretch is the way to go. I love stretch wovens such as cotton sateen or wool with lycra (although I am not a fan of ponte knits, although I guess they are in fact, knits! but they seem like wovens to the touch. I digress) So I had this rather thick cotton sateen that was never going to be a dress as it is just slightly too heavy so perfect for a jacket. And you know I cannot resist that color. It looks a bit rumply here but quite wearable. And pointless to iron (when finished) since it is cotton with lycra, so just go where the fabric takes you. Pressing as you sew - that is quite necessary. After all that topstitching will not be in the right place without nicely pressed seams. Side view. All in all I consider this turned out well, maybe not one of my home runs but perhaps a good double or RBI. It was easier to sew in the non-stretch denim and that pressed perfectly, was a bit easier to topstitch but all in all this is done. You can see I left off the buttons on the upper pockets. Gave it just a little too much of the chest headlight effect. I did narrow this version at the side seams by taking it in at the waist, about 1 inch on each side, it seemed to need a more fitted look than the red one. And here is a little warning, check your work before proceeding to the next step. 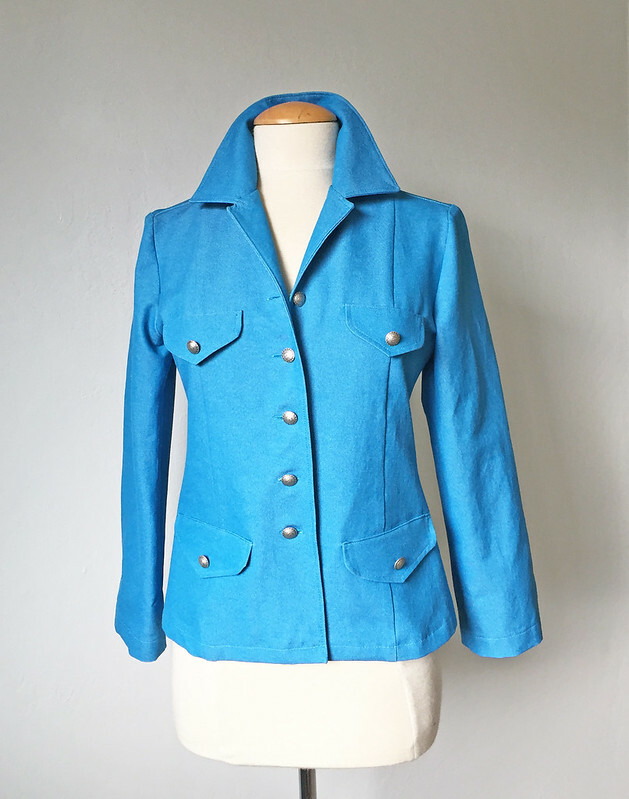 This jacket is a topstitching bonanza, and if you do the topstitching on one sleeve but not the other and sew them both then you will have to rumple up the sleeve and squish all that fabric under the presser foot in order to do it. NOT my most favorite thing to do. Gnashing of teeth at this point. Oh well. Got it done. Who knows what I am talking about? Not bad but this is the one with the problem. I freely admit that this is a case of hasty sewing. Actually, hasty cutting. 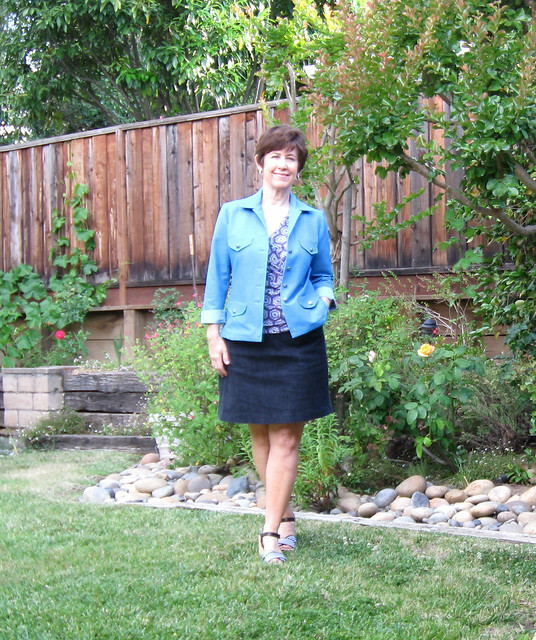 Last summer I thought I would squeeze out this jacket just before vacation, easy peasy, right? Using my self-made pattern blogged about here. And it would have been perfect, but for one little problem. I put the stretch going up and down instead of around the body. And after I had it about 80% cut out, I thought "this seems strange" and then snap! realized and I was SO mad. So I shoved the pattern pieces in a bin and left on vacay. Returned and sewed it up as I don't like unfinished stuff hanging around. It is really cute but slightly uncomfortable. Restrictive in the shoulders and arms. Fine if I walk around with perfect posture but not so great for actual living. Although this denim is stretchy enough that even though the stretch goes up and down it does give a little with movement. Can you tell that it is starting to grow on me? Looking at this picture I think the buttons are slightly in the wrong spots or sewn on too tightly but I will never button it up so screw it, they are staying that way. Also the upper pockets are not there, I just put the flaps. 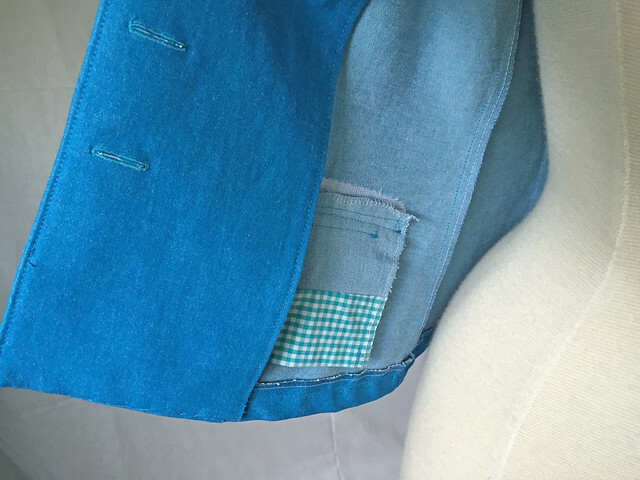 The lower pockets are real, and I did put some interfacing as they are welt pockets under the flaps so need a bit of help. Even though these two jackets are similar in color I can see they are quite different in style so I will probably wear the first one with denim skirts or pants and the second one might be nice with a dress. 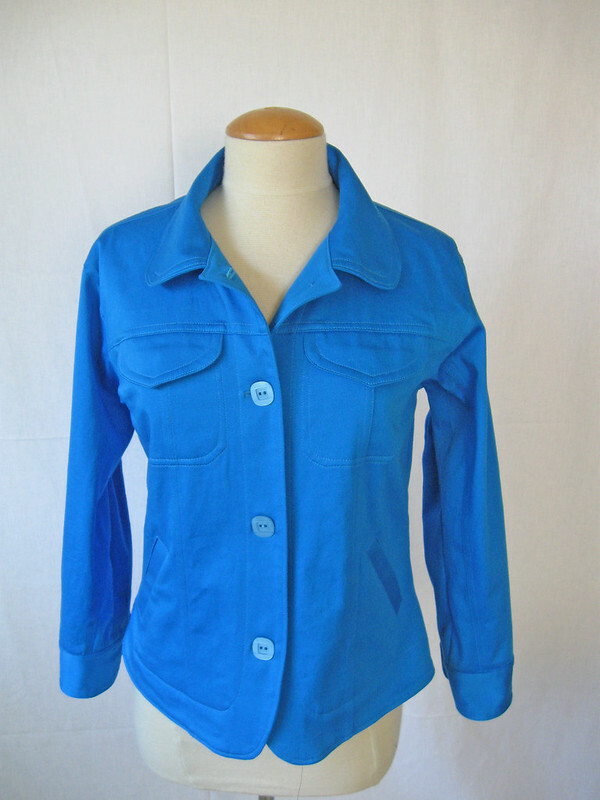 For me in the summer a jacket like this is just something to carry along in case the air conditioning is overwhelming (which to me it always is). 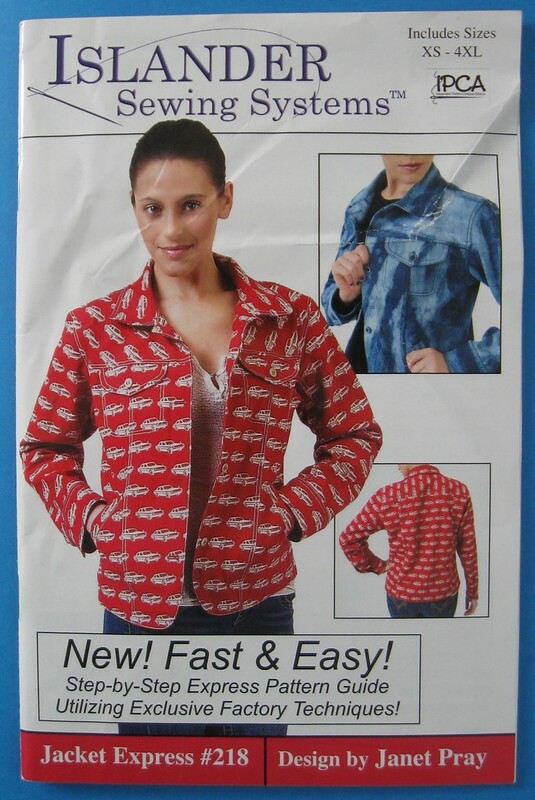 and denim jacket pattern made by me. 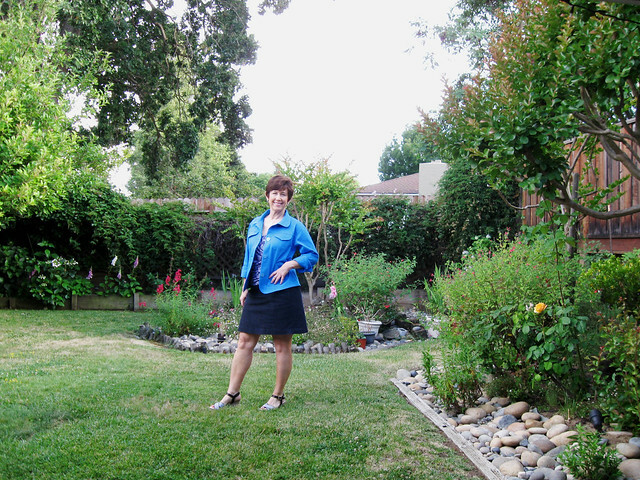 That denim skirt I am wearing in all the pictures is Simplicity 2152 which I wear all the time in the summer. 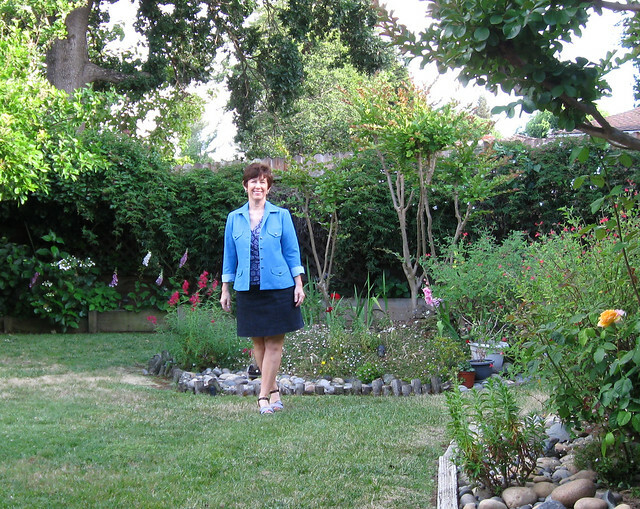 The knit top is Simplicity 1916 pictured here. So maybe I have scored a run or two with these jackets. And you know I have many, many, many items in my wardrobe that complement these colors so no problems there! Perhaps a quick palate cleanser is in order, a knit top or pair of shorts, since summer has tentatively arrived here (finally - such a weird spring). Something I can call a home run. In any case, no more jackets for me for a while. Ok, how many baseball references did you count? I think eight. For any overseas readers - yes, baseball and American english, kind of unintelligible, I know. My European friends who have lived here always remark on this very confusing habit we have of using baseball metaphors in so many conversations. Don't worry - soccer is taking over the world (or has done) and we will have to learn all the soccer references soon enough.